Content by Tony Macklin. Originally published on March 21, 2019 @ tonymacklin.net. Triple Frontier is Kelly's Heroes (1970), without Kelly. And without heroes. It's Treasure of the Sierra Madre (1948), without Bogart. And without character. Triple Frontier is a cruel movie. None of the characters are defined with any depth. They left their substance in the past. In the present, they are willfully one-dimensional. The level of character is that one cares about donkeys; another doesn't. Triple Frontier is named for the infamous border zone between Paraguay, Argentina, and Brazil. It's a region where crime flourishes, because it is difficult to monitor it there. 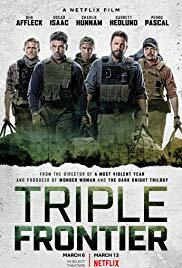 In the movie Pope (Oscar Isaac) contacts former four Special Ops soldiers - Redfly (Ben Affleck), Ironhead (Charlie Hunnam), Ben (Garret Hedlund) and Catfish (Pedro Pascal). They all are just existing in downbeat retirement from the service. They have menial or thankless jobs, with little or no potential or reward. Pope brings them back into action when he's contracted to attack a drug lord, who has millions of dollars stashed in his mansion in South America. The setting is as nebulous as the characters. The group decides to take the money for themselves. The film is about their violent assault and attempted escape with the loot. The motivation at best is shaky, and the ending is phony. It doesn't fit with the characters we have followed. It's unmotivated and not credible. Triple Frontier could have been a good film instead of the brutal, rigged mess it turns out to be. In 2010 it was to be directed by Kathryn Bigelow and written by Mark Boal. And Tom Hanks had been selected to star in the film. Bigelow and Boal had just won Oscars for The Hurt Locker (2008). The film won the Academy Award for Best Picture, and Bigelow won for direction, and Boal won for screenplay. But budgetary problems arose and the film was scuttled. Eventually eight years later the project was directed by J.C. Chandor, with a screenplay by Boal and Chandor. It has been released on Netflix. Bigelow is an Executive Producer of the film among a slew of producers, but Tom Hanks is long gone, and with him the film's possible class. The only accomplished performance in the film is by Oscar Isaac, who stands out because he's the sole actor with more than one expression. Ben Allfeck was 46 when the film was made, so he's added age and physical bulk to his presence, but he's still basically a surface actor. Hunnam, Hedlund, and Pascal play "which one is that?" characters. Adria Arjona plays the informant. Triple Frontier was originally titled "Sleeping Dogs." Perhaps Netflix should have let this dog lie.